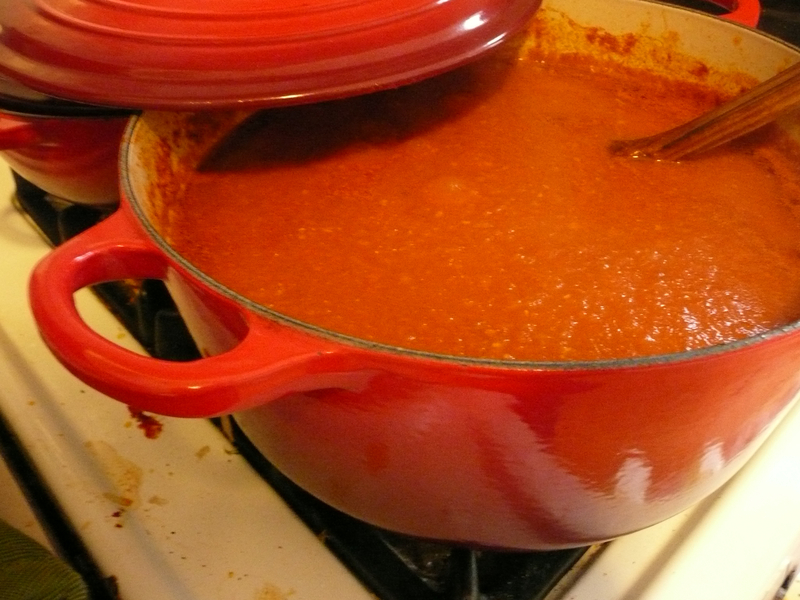 Roasted Tomato Sauce & Tomato Soup Stock: Great for end-of-summer tomato deals. Every year around September, Billy of Billy’s Gardens, who sells at most of our local farmers markets, offers a deal on #2 tomatoes in bulk: a 20-pound box for $25. I generally get a box to help feed my tomato addiction through the winter. Other vendors also offer discounts on tomatoes if you buy in bulk, although that may be more challenging with the cold weather we’ve had this year, and its effects on the tomato harvest. The easiest way to store these tomatoes for cooking is something Billy taught me: Freeze them. Throw the tomatoes whole into a bag or container, and stick them in the freezer. When you’re ready to cook with one, pull it out, set it in a bowl of hot water for a few minutes, pull the peel off, and throw it into your pot. But the last two summers, I’ve turned my bulk tomatoes into a roasted tomato sauce. The sauce can be frozen to last through the winter. Roasted tomato sauce develops a sweet, rich flavor. An added benefit is that the liquid which seeps out of the tomatoes can be poured off to and used as a wonderful soup base. 2. Wash tomatoes. Arrange them in deep baking dishes. Three large, rectangular Pyrex baking dishes, or two large ones and two small ones, should do it. 3. Peel garlic. Intersperse the garlic cloves with the tomatoes. 4. Sprinkle salt, pepper and olive oil all over the tomatoes and garlic. 5. 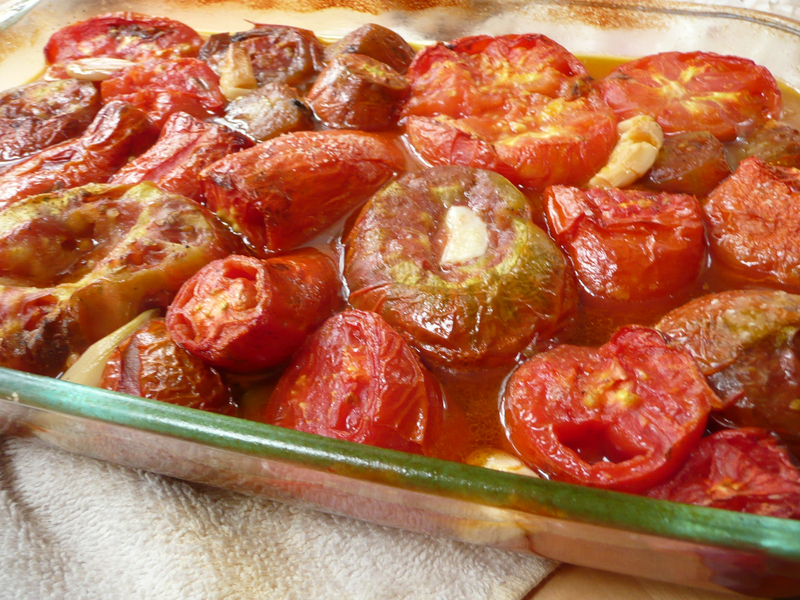 Roast for about an hour and a half, or till tomatoes are falling-apart-soft. If tops are drying out, spoon some of the liquid that is building up over the tomatoes. 6. 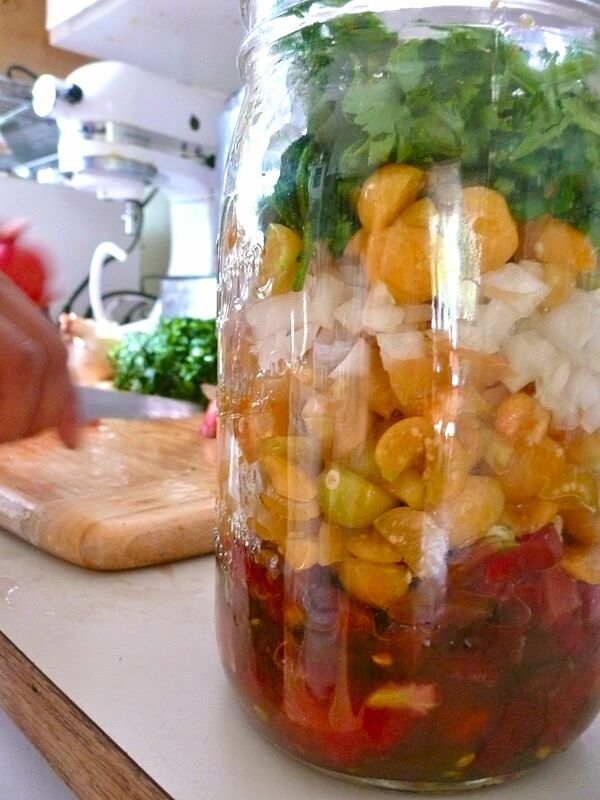 Pour the liquid that has accumulated into a jar or jars and save it (fridge or freezer) for soup-making purposes. It’s rich and tasty, a great broth for soups involving things like eggs, parmesan, vegetables, lamb or beans. 5. Pour remaining tomatoes and garlic into a pot (I had to use two and you probably will too). Immersion blend them (or process in a food processor). Taste and adjust salt. Cook on the stovetop on low for 30-45 more minutes until it has a rich, fully-developed flavor. 6. Freeze the sauce. 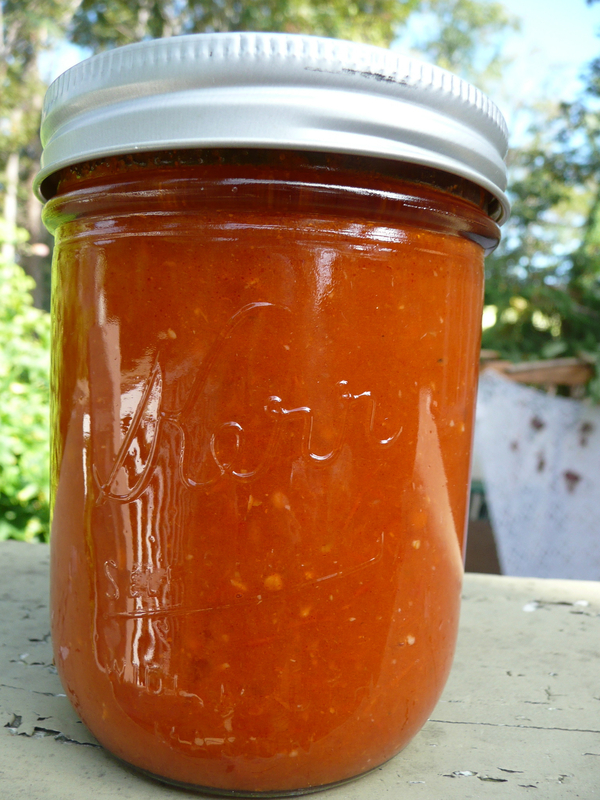 (I canned the sauce in the past before I realized canning guidelines for tomato products require a certain acidity level and use of a formally tested recipe such as this one or recipes through USDA or university cooperative extension programs.) You can freeze it in jars or in ziplock freezer bags. This is easiest if you cool it first. The fastest way I’ve found to cool it is to pour all the hot sauce into a thin pot that hasn’t been sitting on the stove, and then to set that pot in a sink full of ice water that isn’t deep enough to come over the rim. Once the pot has cooled a fair bit, put it in the fridge on a coaster. The next day, ladle the refrigerated sauce into your preferred freezer containers and freeze. Events from City Fruit (forwarded via CAGJ). Want to know what to do with green tomatoes? That one caught my eye. If I don’t make the class, I’m going to be working on some of my own recipes, thanks to Seattle’s charming lack of proper-length summer this year.. If you’re a northwest gardener, you’ve got ‘em—green tomatoes that didn’t ripen before cool weather set in. Come learn creative ways to use the last of your tomato harvest, no ripening required! Turn your green tomatoes into relishes, bake with them, or just cook up some simple recipes for dinner. And if you can’t cook up all your green tomatoes, learn how to ripen them off-the-vine. 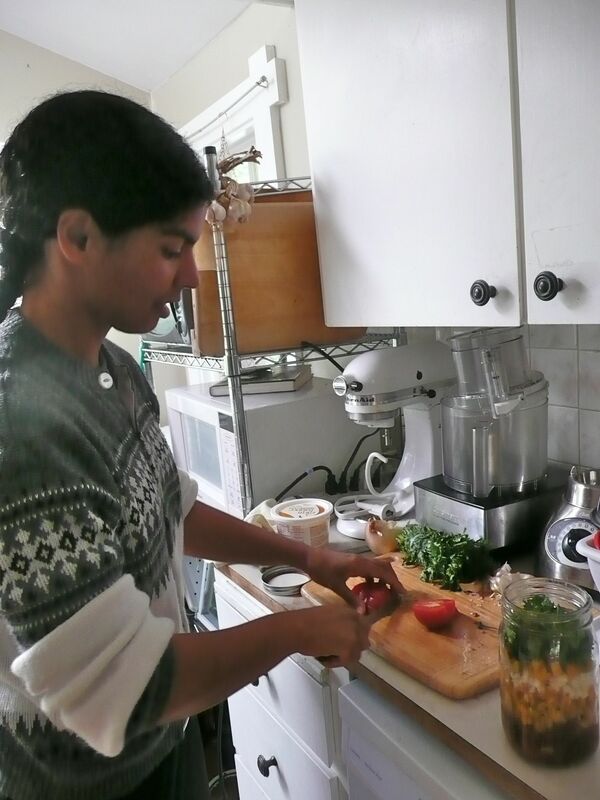 Instructor Kristin Danielson-Wong brings over 20 years of experience in food preserving and teaching, and she just might like green tomatoes better than red. $15 members, $20 non-members. Register at https://www.brownpapertickets.com/event/130512 or send a check to City Fruit, PO Box 28577 Seattle 98118. Fall is planting time! Plant your tree before the ground gets hard and get a head start on your fruit. By using good planting, watering, and pruning techniques, and learning to recognize problems, you can give young trees the best chance to become healthy and productive. The class covers site selection, fruit tree selection (how large? What type? ), where to buy fruit trees, how to plant them and how to care for young trees. Jana Dilley works on the Green Seattle Initiative with the City of Seattle Office of Sustainability and Environment. She has a master’s degree in Forestry and in Public Affairs and has organized community tree-planting events in Seattle and California. $15 members, $20 non-members. Register at https://www.brownpapertickets.com/event/114585 or send a check to City Fruit, PO Box 28577 Seattle 98118. Sunday, October 10, 2:00-4:30 p.m.
Canning is the premier way to preserve fall’s harvest at home, whether from your own yard or the market. In this class, you’ll learn tips and techniques to can safely and successfully at home, so you can preserve the season to enjoy all year long. Taste some plum jam made while you watch from City Fruit’s harvest. Instructor Shannon Bailey is a local canning expert who has taught many workshops on food preservation. $15 members, $20 non-members. Register at https://www.brownpapertickets.com/event/130544 or send a check to City Fruit, PO Box 28577 Seattle 98118. It’s time to turn your fruit harvest (or your favorite farmer’s) into homemade pies, for special occasions or an everyday treat. Our instructor Tracey Bernal has worked as a pastry chef and cook at Campagne, Café Septieme, the Palace Kitchen and the Dahlia Bakery. Tracey will cover methods and recipes for crusts and fillings, including reading recommendations. She’ll also show you make-ahead methods for fillings and crusts and how to put up fruits for pie fillings. Don’t miss this rare opportunity to learn from a true culinary professional for an affordable price. $15 members, $20 non-members. Register at https://www.brownpapertickets.com/event/130802 or send a check to City Fruit, PO Box 28577 Seattle 98118. We’ve covered a few different ways to preserve or cook salmon, like making gravlax and broiling fresh salmon. 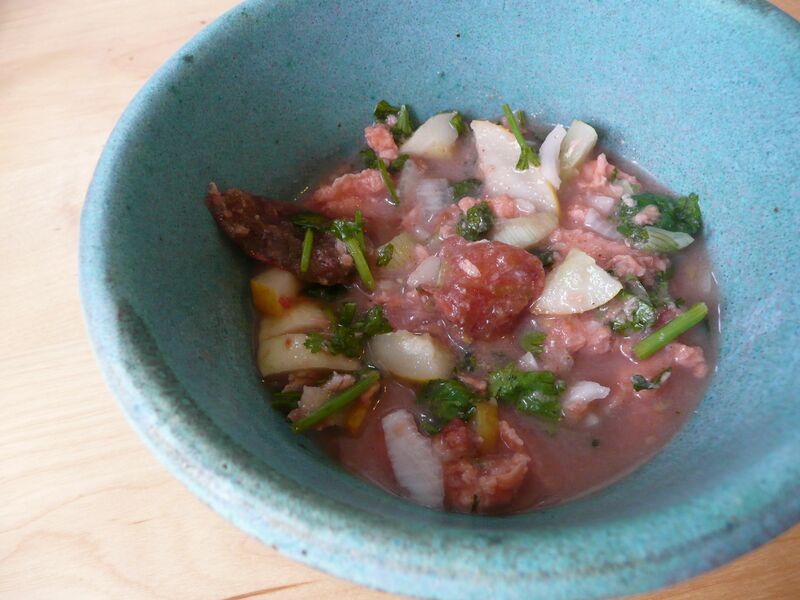 I finally got to experiment with another salmon treatment I’d been wanting to try: Ceviche. Ceviche is a Central and South American dish, a way to cure raw fish using lime juice, a bit of salt, and other flavors like tomato, onion, cilantro, chilis, and vegetables. It’s a much quicker cure than gravlax; gravlax takes two days, whereas ceviche is cured and ready to eat in three or four hours. The impetus for this ceviche came from something the guys at Wilson Fish sell at the farmers markets where they vend. They have little bags of salmon bits they call spoonings, the fatty, delicious parts scraped off the backbone after filleting. I use them for coconut milk curries most of the time, but wanted to try something new. Like salsa, ceviche does not follow an exact recipe. My recipe was pretty unplanned. Juice of one lime wasn’t enough for the 1/3 pound of salmon bits, so I did two. Salt to taste. Two cloves of garlic chopped fine, half a sweet onion, a large tomato, a handful of cilantro, a lemon cucumber, a few hot chilis. It was what I had in the fridge that sounded like it would go in ceviche. Experiment with other ingredients on your own. Halibut would also taste great (and is a bit more traditional), and so would cod or other white fish. 1. Chop salmon into bite-sized pieces. 2. Chop all other ingredients fine. Combine with salt and lime juice. 3. Refrigerate at least 3-4 hours or overnight. Salmon: Does food get much better? Salmon is fatty, full of vitamins and omega-3s, flavorful. It’s local and traditional in the Northwest. It’s fast and easy to cook. And yet there are so many ways salmon can go wrong. There’s farmed salmon, whose failings have been detailed plenty of other places. There’s old salmon, tragically not eaten while it was fresh. And then there’s overcooked salmon, a chewy, dry reminder of what it could have been. Breaks my fish-fond heart. I credit my perfectionist-scientist mother with my salmon-cooking skills. We spent summers in Seattle when I was a kid, where my mother, standing at the little Habachi grill (which I think was $5 at Pay ‘n’ Save? 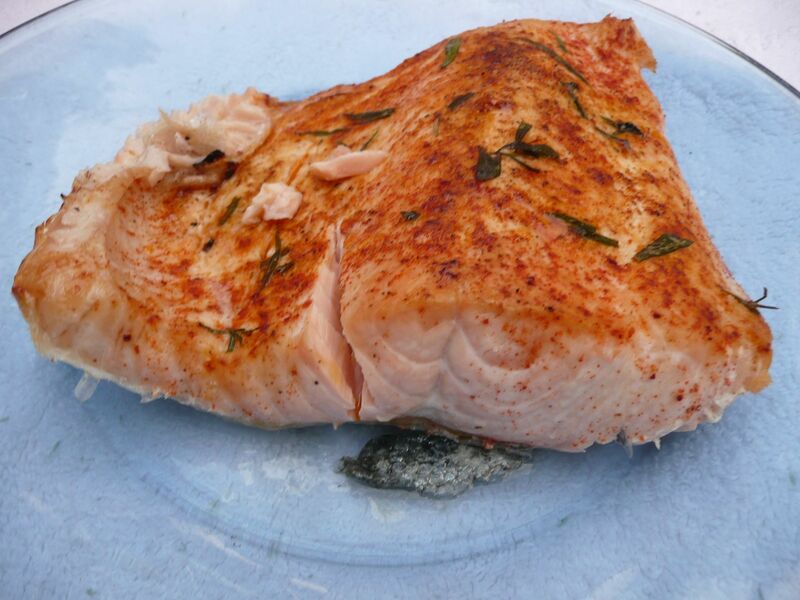 ), or at the oven set to broil, produced perfect salmon with the same meticulous attention she applies to research. Flaky, flavorful, moist. We ate it with Northwest vegetables, homemade tomato sauce, blackberry pie, leaving permanent Northwest flavor imprints in my memory. The salmon even converted salmon-haters like my friend Ellie, who had never liked salmon until my mother made it for her the night Ellie and I met, when she was ten. The secrets lie in selecting the salmon carefully, and serving it very slightly underdone. ~ Choose salmon that is very fresh. Ask when it was caught. It should look firm and bright, not dull. It shouldn’t smell funny. Buy from a reliable vendor. I love the fish from Wilson Fish at the Ballard, Wallingford and Madrona farmers markets, and Loki’s stuff is also good. There are great vendors down at Pike Place. I’ve had some luck at Madison Market and at Mutual Fish on Rainier. ~ Choose belly fillets (the one that’s thick on one side and thin on the other) as opposed to tails. Belly has more fat and the thickness gives the fish better consistency. King is the fattiest and best, but is also expensive. Go for as thick and high-fat as you can find/afford. ~ Fresh is better than frozen. Fresh has better consistency. Frozen is okay if you can’t get fresh. Salmon on a grill is still the best. If you’re doing that, follow the directions below for doneness and seasonings. Cook it face-down first, so the fat from the skin soaks into the meat. Then, flip and let it cook until it’s done, while letting the skin get a bit grilled for added deliciousness. Get one of those cage-like fish-flipping devices; it’s a good investment to make this process easier. This recipe is for salmon in your oven set to broil. It’s easy and comes out great. 1 fillet of salmon, preferably belly. 1. Set broiler to high and position rack right under the flame at the top of the oven. 2. Line a baking dish or oven-proof skillet with aluminum foil. (You can skip the foil if you don’t mind serious scrubbing). 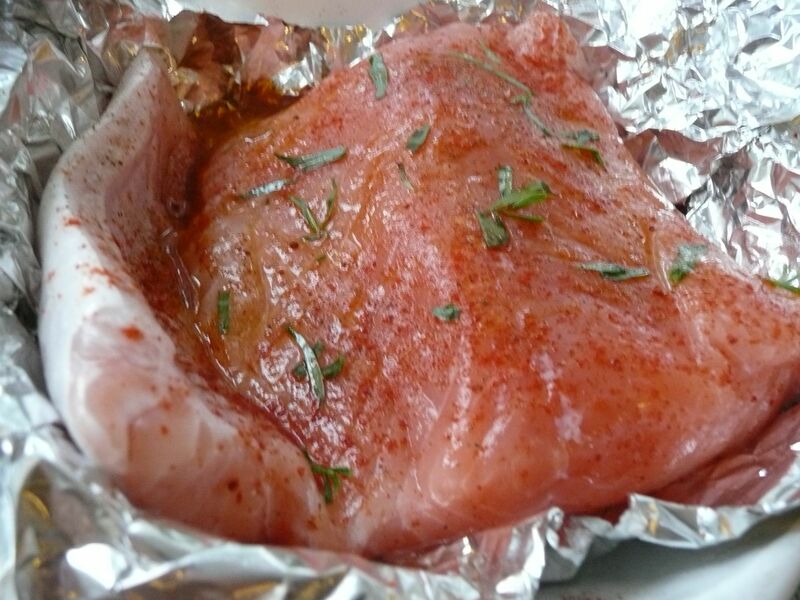 Place salmon on the foil. It’s okay if the thinner side is a little folded, so it doesn’t dry out. This helps you get away with using a slightly-too-small pan, too. 3. Drizzle with olive oil. Add on bits of other toppings if you like. You don’t need much, because salmon is so flavorful on its own, but a bit of smoked paprika can be nice, as are any of the flavors listed above. If using herbs like tarragon, press them down into the oil coating the fish. 4. Set under the broiler. Check frequently. Estimates vary between 7-10 minutes per inch of thickness, but I prefer to watch it. ~ And the MOST IMPORTANT: cut into the thickest part. At the bottom, you should have some translucent, raw-looking fish. BUT! This fish is easily parted with a butter knife. If there’s raw-looking salmon that can’t be teased apart with a butter knife, it needs another moment. If it can, DO NOT cook the salmon any longer! 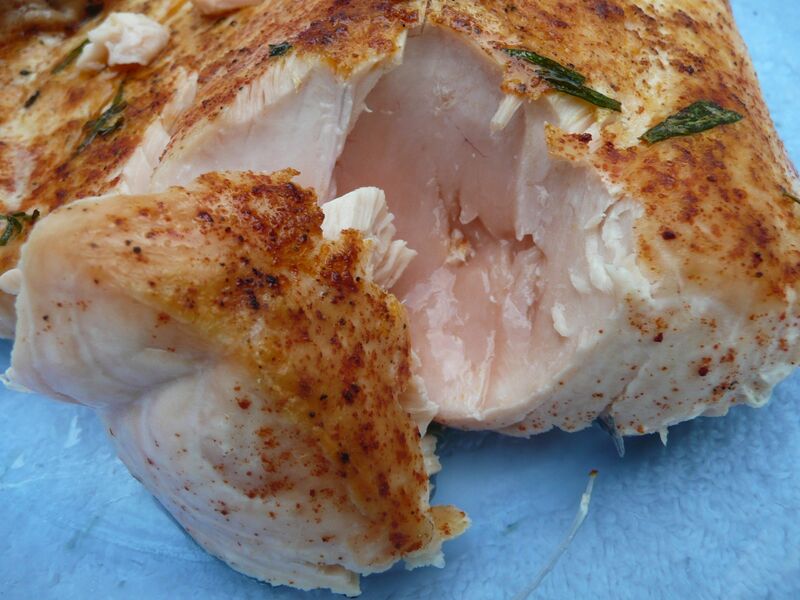 The fish is moistest and most delicious when you leave this translucent area as so. Photo evidence: This salmon is perfectly done! That translucency is your friend! Serve salmon simply with a side of steamed vegetables and butter, or with some vehicle for homemade tomato sauce, or whatever you like with salmon. Remember also that the skin is delicious and full of nutrients. If it’s too chewy for you, fry or broil it on its own a bit until crispier. I live with people who like to cook, which is a happy thing. Today, my roommate Adina, stuck at home with a busted knee, was inspired to turn some local ground cherries and tomatoes into salsa, also using up some cilantro from our CSA box and limes a friend had leftover from a party. I see taco nights in our future, as well as scrambled eggs with salsa, and other deliciousness. 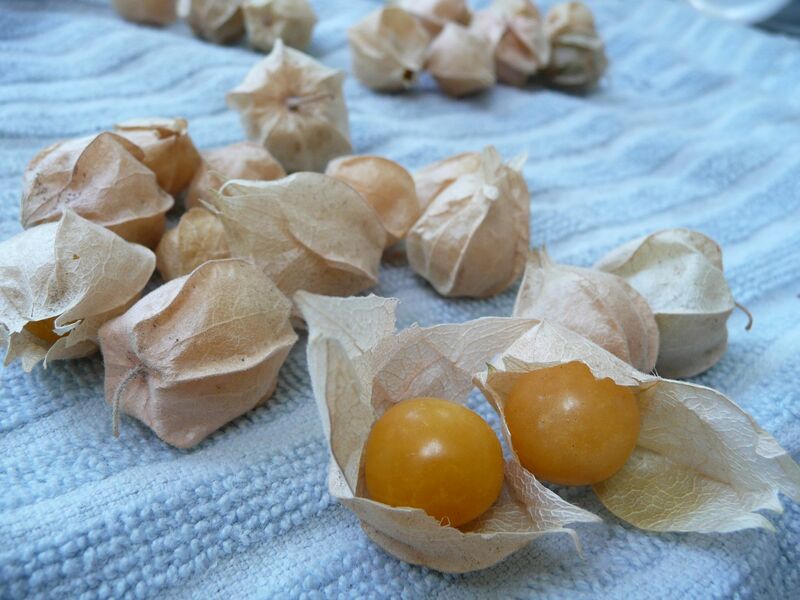 Ground cherries, by the way, are cute little yellow-orange fruits that come with a wrapper, much as a tomatillo does. They’re similarly dense and tangy, but quite sweet when ripe. The ground cherries in here work particularly well. You get a spectrum from slightly sweet to acidic: sweet ground cherries, sweet-acidic tomatoes, and acidic lime. Let them meld for happy salsa results. 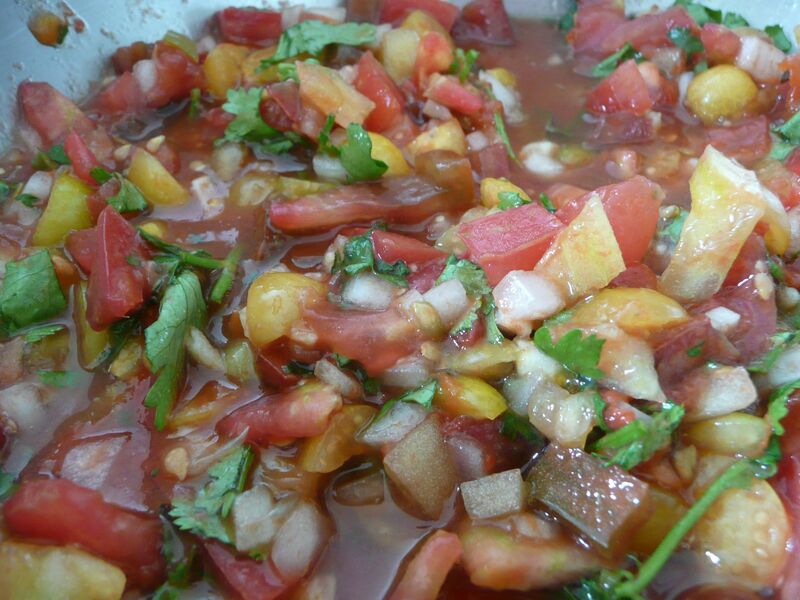 If you can’t find ground cherries, firm peaches or other fruits are also tasty in salsa. While Adina was chopping tomatoes, I realized something: Fresh tomatoes have a smell. I don’t mean the dusty, wonderful scent of the leaves and skin, but the flesh itself. I don’t think of it as pungent, but from across the room I could smell the ripe inside of a freshly-cut tomato. Anyway, here’s the description. 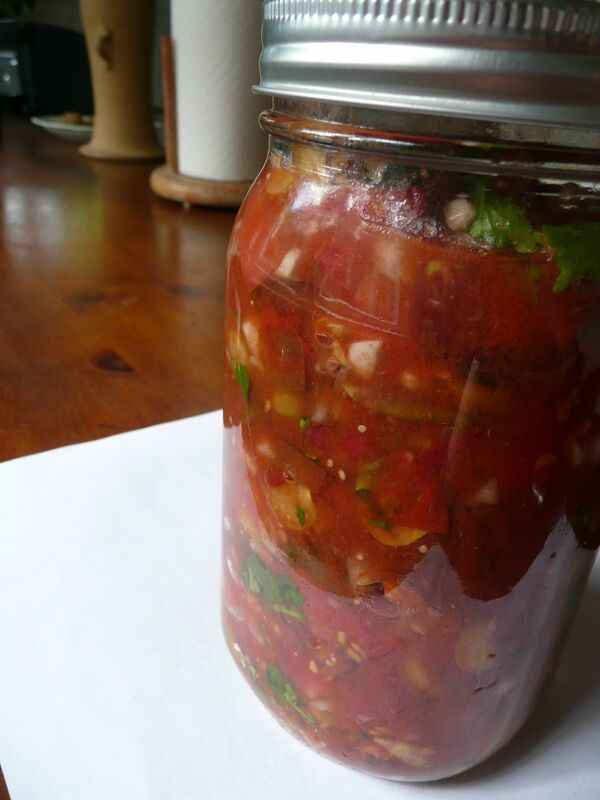 Salsa is not an exact recipe kind of food — it’s more a good excuse to use up things you have around. You can throw in a few unripe tomatoes from the garden (cough, Seattle summer FAIL, cough) or bits of vegetables and herbs. 1. Chop three of the tomatoes. Set aside fresh. Peel and chop all garlic. Chop jalapeños. 2. Chop the other two tomatoes. In a small pot, stew these two tomatoes with salt, about 2/3 of your garlic, and the jalapeños for about 30 minutes till thick and saucy. Let it cool so it doesn’t cook fresh ingredients. 3. Chop onion fine. Chop cilantro. Mix together these ingredients with the chopped fresh tomato, the lime juice, and the stewed ingredients. The salsa tastes best if you let it sit at least a day. Keep it refrigerated. Smoked Tuna Salad, New York Deli Style. Plus Homemade Mayonnaise! I grew up in New York. My soul food is: bagels with scallion cream cheese, whitefish, and nova salmon. Pastrami on rye with mustard. 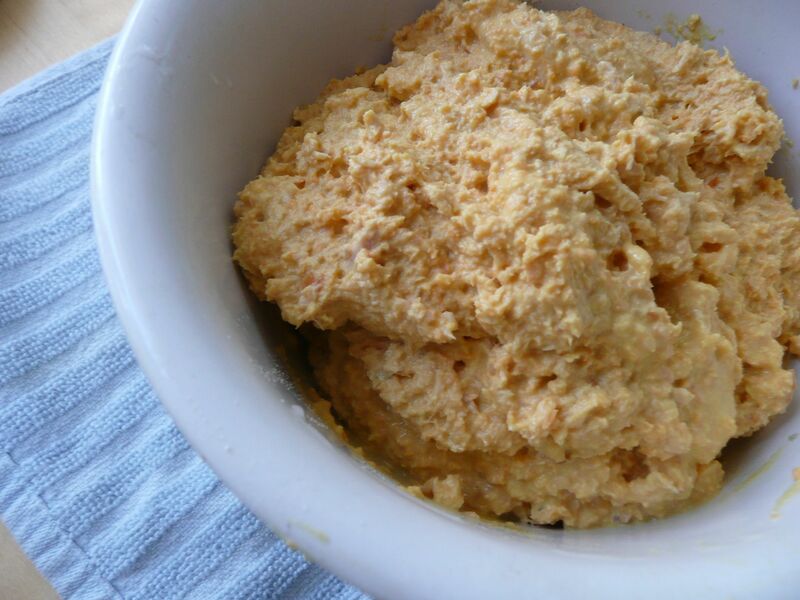 Deli-style tuna salad, nearly puréed. Half sour pickles. Heavily-seeded rye bread. Most of this, I can’t get on a daily basis. For starters, there is no decent whitefish in Seattle. I’m gluten intolerant and try to eat high-fat/low-carb when I’m eating optimally, so not so much on the bread (except for treats or NYC visits). I do make my own pickles, and the I Heart NY Deli on Roosevelt has pretty great pastrami. But there are foods I miss. Surprisingly, tuna salad is one of those foods. That New York deli style tuna salad is different somehow. I’ve spent years trying to replicate the tuna salad at a little schmancy foods store in Manhattan called Todaro Bros. It’s puréed with [lots of lemon juice] [Edited 2014: Apparently no lemon juice, according to the store, but I like it anyway], good quality mayonnaise, and finely grated carrots and celery. I still go out of my way when I visit New York to get to Todaro’s and eat some. But the holy grail tuna salad in New York is something called smoked tuna salad. Tangy, smokey, a little orange, and utterly addictive. Not easy to find; I found the perfect one once in some obscure little deli in midtown and never found anything as good since, although plenty of delis carry a version. It’s been probably seventeen years since that perfect smoked tuna salad, and I still can’t get the taste out of my head. I’ve tried to replicate it, like the Todaro tuna. I’ve used actual good quality wood-smoked tuna from the St Jude tuna guys at the farmers market here (they also have great canned tuna). I’ve used regular tuna with smoked paprika. I’ve failed. A special-association taste is hard to fake. Your tongue knows when you’ve gotten it wrong. Today, I got it right… by accident. I was making lunch for a bunch of people building a sukkah. I thought I’d purée the tuna salad quickly in the food processor, with homemade mayonnaise and grated carrots, going for my best shot at that Todaro tuna. Then I realized I’d put in too much mayo for the tuna, and didn’t have another can. While a friend ran to grab me another from her house, I impulsively threw in some leftover Loki chunk smoked salmon from the freezer. Okay. It’s possible this isn’t what delis do to make smoked tuna salad. But I think it is. Reason 1: it’s the same color, a little more orange than tuna salad. Actual smoked tuna isn’t that color. Reason 2: Smoked salmon is much easier to find in New York than smoked tuna. Reason 3: It tastes exactly right. If you’ve never had New York deli style smoked tuna salad, or if you crave it from 3,000 miles away, try out this recipe and tell me what you think. You can get nearly all the ingredients from local producers (aside from lemons): canned tuna, smoked salmon, carrots, optional celery. It would make an amazing tuna melt, or just a good lunch with some vegetables, tomatoes, cheese and lettuce. Proportions are variable according to your taste. Final product should be fairly smooth, puréed with texture and not liquidy. herbs or spices to your taste. However, they’re not really necessary with this version. 2. Grate carrots and celery finely. The easiest thing is to attach a grating top blade to a food processor and grate them right into the food processor body, in which you’ll make the tuna. 3. Add to carrots and celery: tuna, salmon, mayonnaise, lemon juice and salt. Start with the lesser end of the mayonnaise, and you can always add more. 4. Pulse food processor as it combines ingredients. Add more mayonnaise as needed. Keep pulsing until puréed with a textured consistency and not liquidy. The linked directions above work great for a bowl. This is the food processor version. Note that it contains a whole egg, whereas bowl mayonnaise contains just a yolk. 1. In bowl of food processor crack egg, add lemon juice or vinegar, salt, mustard, and any flavors. Pulse a few times. 2. Add top to food processor but leave open the space where you can pour things in while the food processor is running. 3. Measure out your cup of olive oil. With the food processor running, SLOWLY pour the olive oil in, in a very thin, steady stream. If you pour too much, take a break and let it emulsify. Keep going until you’re out of oil. You have mayonnaise.